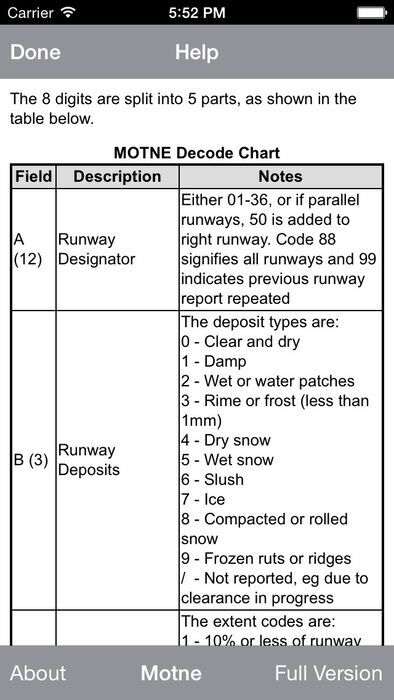 Snowtam Lite is a quick and intuitive tool for pilots to decoding 8 digit MOTNE codes, which provide information about runway condition. The spin dial interface ensures that invalid codes cannot be entered. The application also provides a complete breakdown of the codes in the help page. The full version of Snowtam provides several additional features, including decoding of Snowtam report, cold temperature corrections and an in-built database of +12,000 airport ICAO codes.